I must confess to being somewhat more anxious about the new creative team for Green Lantern Corps than I was for the main Green Lantern title. Though I've always been a big Geoff Johns fan, I found Peter Tomasi's take on the many characters in the GLC to be a more reliably enjoyable read. I was somewhat reassured when I heard Bernard Chang (whose recent work on Demon Knights I'd enjoyed greatly) would be taking over the art duties and that the plotting would be done by Demon Knights writer/new Green Lantern writer Robert Venditti with the actual scripts being written by Van Jensen of the excellent Pinocchio, Vampire Slayer series. So did the book measure up to my hopes? Yes, but it was nothing like what I'd expected and I'm quite relieved by that. The events of this issue take place concurrently with Green Lantern #21 but it appears this issue starts at a slightly earlier point. The primary focus of the issue is John Stewart and Yrra of Xanshi (a.k.a. the former villain formerly known as Fatality) as the two work to save an endangered planet while discussing their relationship... or lack thereof. The rest of the issue shows us the new status quo for The Corps command structure, as Salaak retires from his post as The Guardians' majordomo. Four new characters are forcibly recruited into the Corps, seemingly arriving in time for Larlfleeze's attack on Oa in Green Lantern #21. Already Jensen has proven himself capable of handling this diverse cast of characters. Indeed, he's given John Stewart and Yrra more character development and analysis in this one issue than they received during the entirety of the Wrath of The First Lantern saga, pointing out how incredibly screwed up Yrra's become in recent years as he recalls her history for new readers. Star Sapphire brain-washing aside, it makes little sense for her to be head-over-heels in love with the man who was directly responsible for her homeworld blowing up - an incident which inspired her to become a slayer of Green Lanterns and eventually a Sinestro Corps member. Ah, but when does love ever make sense? And no sooner do I start to question why the love-empowered Yarra simply can't use her ring to detect the love in John Stewart's heart instead of asking him repeatedly if he loves her, we get a simple, logical explanation why she doesn't. 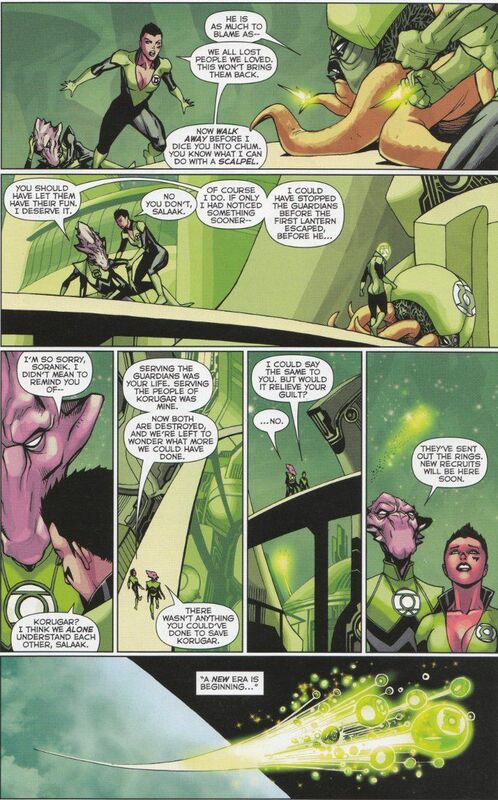 Another welcome touch is the return of Soranik Natu. 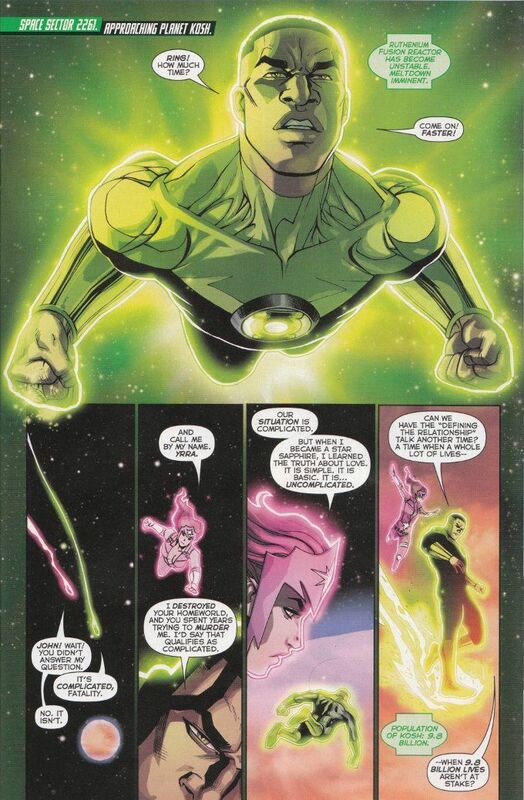 One of the best Green Lanterns created over the past decade, Soranik had a lot of baggage that caused her to disappear from the series as The New 52 began - presumably because it was easier to ignore Sinestro's daughter/Kyle Rayner's ex-girlfriend than to try and fit her into the new timeline. Thankfully, Jensen ignores these issues and focuses instead on presenting Soranik as the awesome character that she is. Bernard Chang's artwork proves as skillful as usual. Chang's excellent eye for detail displays itself in every panel of this issue. It bodes well for the series - so dependent on diverse and physically distinct characters - that Chang is signed on for the long-haul. Apart from my continued concerns that this book may soon become too heavily interlocked with the other series in the Green Lantern family of books to stand on its' own, I have no complaints about the new Green Lantern Corps. The scripts are solid. The artwork is grand. And despite being heavily dependent upon the continuity of the series so far, Jensen does a fine job of explaining it all and making this book accessible to new readers. If you haven't read a Green Lantern book in a while or are just a fan of good science-fiction, this is the book to get!